Hello Webmaister, Wull, I don't want to fall out with Agnes McShane (Graham) over the picture for 1948/49 but No. 6 in row 3 is ME! I recognise the tank top. I think John White is No. 5 to my right. Behind me in row 4 is Alec Marshall (4) and Donnie McLeod (6). David Wellwood was the best teacher I ever had, especially when he picked me to play in the school football team. My first crush was for Kathy Gow in the front row. Smashing days. Love the GlescaPals website. I just wish the memory would bring back all the names that I once knew. 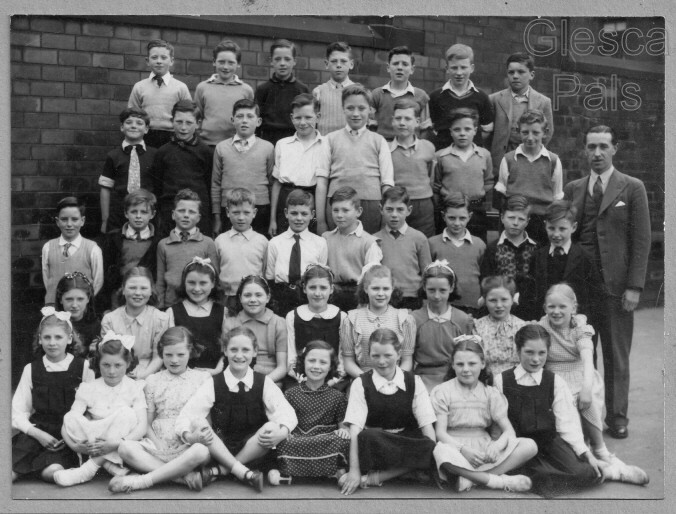 I remember having a 'go' with John Spiers (wee guy at the left of my row) in the playground. Can't remember why, but I do remember we circled each other for about ten minutes with the dukes up, never laid a blow on each other, then noticed that the onlookers had got bored and left us alone in the playground. So we picked up our jackets and went home.